Pretty sneaky, Microsoft. While some vendors were scrambling to release updates to fix the KRACK Attack vulnerability released today, Microsoft, quietly snuck the fix into last week’s Patch Tuesday. While Windows users were dutifully installing October 10th’s Patch Tuesday security updates, little did they know they were also installing a fix for the KRACK vulnerability that was not publicly disclosed until today. 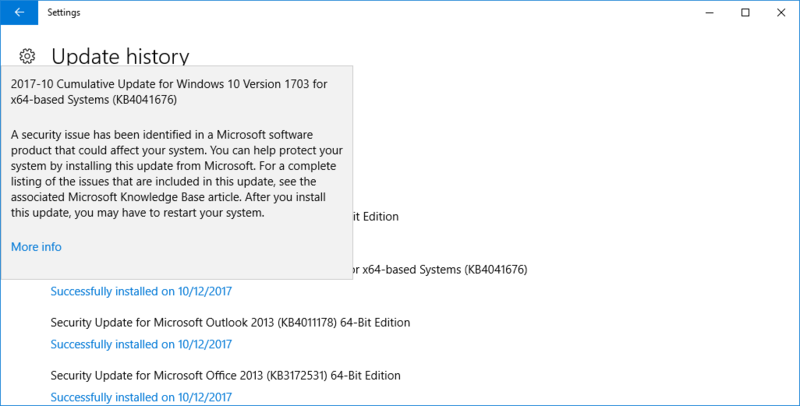 This fix was installed via a cumulative update that included over 25 other updates, but didn’t provide any useful info until you visited the associated knowledge basic article. Even if you were bored enough to actually click on the More info button, you would have had to be REALLY bored to even spot a reference to a vague mention of a wireless security update in the last bullet item of the knowledge base article. While, I am not typically a fan of sneaky updates, I understand why it was necessary to fix the vulnerability while keeping information about it secret until it was officially disclosed. Did Microsoft do the right thing quietly patching the update or is full disclosure the only way to go? I will let you decide. “Why did OpenBSD silently release a patch before the embargo? « WPA2: Broken with KRACK. What now?